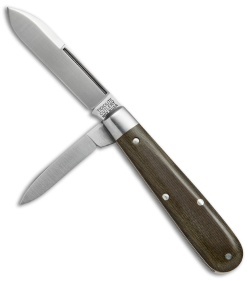 Recapture the glory of youth with the Tidoute Boy's Knife from Great Eastern Cutlery. This traditionally designed pocket knife makes the perfect beginner knife for younger knife enthusiasts or a reliable EDC blade for seasoned veterans. It offers a slip joint design with a nail nick for quick blade access. US made quality ensures a long lasting knife that will stand up to your toughest cutting jobs. This Boy's Knife model sports a two blade design with an OD green linen micarta handle and polished steel bolsters.